Saturday morning was spent leisurely doing laundry, eating waffles and trying out my mother's dehydrator that she left here when she moved. I found some clearance turkey lunch meat at the store on Thursday so I bought 4 packages. The dogs love turkey but they swallow it in 2 seconds and I wanted it to last a little longer. I used to buy the chicken jerky from the pet store but it is so expensive and then people started complaining that the chicken from China was making their dogs sick so I stopped buying it. 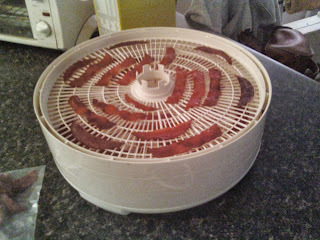 This was the perfect opportunity to try out the dehydrator so I cut the turkey in to strips and a few hours later, I had turkey chips. They got a little over dry so they are crispy not chewy but I still call that a success. Now the dogs take a whole 5 seconds to eat them instead of 2 seconds. While I was waiting for the turkey to dry, I flipped through the dehydrator manual and found recipes for dog and cat treats. I thought I was being original, haha. Next time I think I will blend the turkey with sweet potato and oatmeal and make some dried dog cookies. I think I have stumbled upon a new hobby. Later in the afternoon, I went out to my property. The communal dirt road is almost impassible. There is a large hole in the dry creek bed where the monsoon rains washed the dirt away. I know most of my neighbors aren't interested in road repair. I wonder what they will do if they can't get up the road at all. When I got to my property, I noticed something new. On the other side of my driveway the road was paved. The one neighbor who is willing to pay for the road had paved part of the road which leads to his other entrance. This other entrance is also my road access for my 3 acre property. I bought the extra acre on the other side of my property so that I could get out using the other road that no one wants to maintain. My problem is that my driveway goes through a deep dry river bed and the water run-off from my hill really erodes the road. So, with either road, I have a problem. It is nice to have 2 access roads though. Someday I will have enough money to deal with the problem. My neighbor, the one who paved the road, just happened to be out for a walk when I was inspecting the new pavement so we chatted for a while and I got caught up on all the neighborhood happenings. After that I started cleaning the mobile home. It was great to clean some of the dust and throw things away. I mean, there was still paper on the floor from when I had puppies in the bathroom almost 2 years ago! It was getting late so I loaded up my truck with more boxes and then went searching for a cactus to give to a coworker. I didn't find any special cacti so I cut a piece of Ocotillo because she wanted another and they grow easily from cuttings. It was dark when I got home so I didn't unload until today. It was a good trip. I felt like I accomplished a lot and I didn't see any snakes or bugs except for the ants but they were outside. Next time I go out there I want to meet up with the contractor who will tell me if my garage should be torn down or if it can be fixed. On this trip, it looked like it could be saved but it wasn't built to code so maybe it should be torn down. I need professional advice.